Summer is perhaps one of the best seasons for eating – weekends are for cookouts, piles of colorful produce flood farmers’ markets, and restaurants eager to open their patios and porches get creative with menus. Since I started this blog, there has always been one dish that best defines my summer repertoire: pie. I’ve made lots of pies, and have tried nearly every approach to pie dough (including a unique experiment with vodka); yet the all-butter crust that my grandma would be proud of is tough to beat. For this post, I made a bite-sized version with these Rhubarb Cream Cheese Hand Pies. I found this rhubarb at the farmer’s market – big, ruby stalks of the stuff. Their pigment comes from varying levels of anthocyanins (the same compound that colors blueberries and black rice; ahhhh science). Even though it’s a vegetable, rhubarb is often prepared in dishes that are fruit-forward. The tart flavor and celery-like texture lend themselves well to compotes and jams and pie fillings. For this recipe, it’s simmered with nothing more than sugar; and you don’t even need to really stir it. You want the mixture to have as little liquid as possible when done, so it’s easy to work with when filling the pies. The trick to handmade pie crusts is to keep the dough very cold; from start to finish. It can be frustrating…especially when you’re working on a hot summer day, but it’s worth the patience. If you have to refrigerate the dough halfway through making it, that’s OK. It’s also a little messy (with all the flour) but again, worth it. I could have chilled the dough a bit longer before starting the assembly process…but was watching Westworld and became too focused on keeping up with the plot twists. All the same, they tasted great! Click HERE to make this recipe a new summer tradition. Summer and pie are a perfect pair, rousing memories of lazy, hot days with sweet iced tea and picnic blankets. Today was a perfect example of that kind of weather…although I spent a good deal of it beneath a fan with the A.C. blasting. In thinking about a musical pairing, one of my favorites came to mind – Knoxville: Summer of 1915, Op. 24, for soprano and orchestra (by Samuel Barber). This piece takes it inspiration and prose from the James Agee essay of the same name. Agee allegedly wrote the piece in an hour and a half. To date, it is one of his most famous works. The story is woven by the childhood memories of our protagonist, who paints a scene of her family lounging on quilts in the backyard while listening to the birds and streetcars passing by. While our protagonist relishes in this memory and the perfection of that summer evening, there is bittersweet inflection in her words: the now adult is all-too-aware of the passing of time and the journey to find one’s identity. In empathy, it’s difficult to not feel a yearning for the simplicities of childhood. The following recording features soprano Leontyne Price with the New Philharmonia Orchestra – I hope you enjoy! Myers, Chris. “Knoxville: Summer of 1915,” Redlands Symphony. 2015. I am a total sucker for food magazines – the too-good-to-be-true photography, elaborated by mouth-watering tales and anecdotes, with star-studded chef contributions…there’s always at least one dish that catches my eye, and receives a “must-make-now” bookmark. 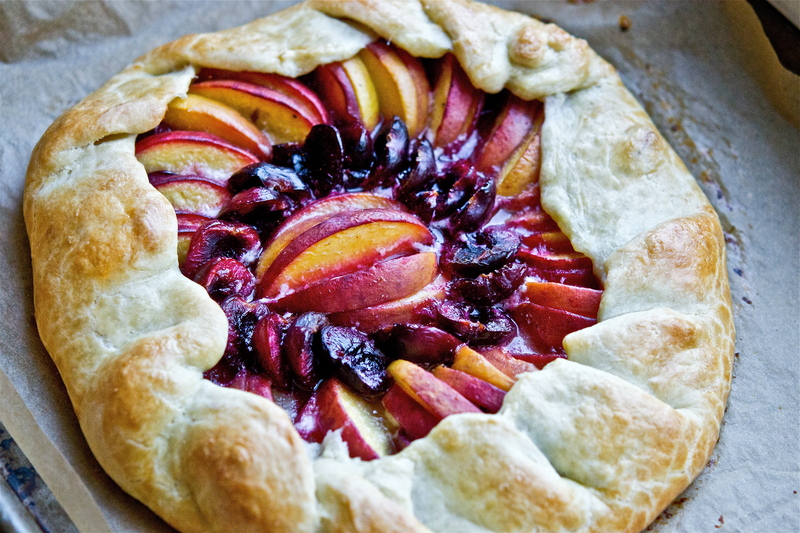 I was sifting through some old magazines and happened across a gorgeous galette. This term is used to describe a variety of free-form pastries and cakes found in French cuisine, and is often typified as a “rustic” creation. In reality, most galettes are far from rustic, as the beauty of this dessert is its imperfection. 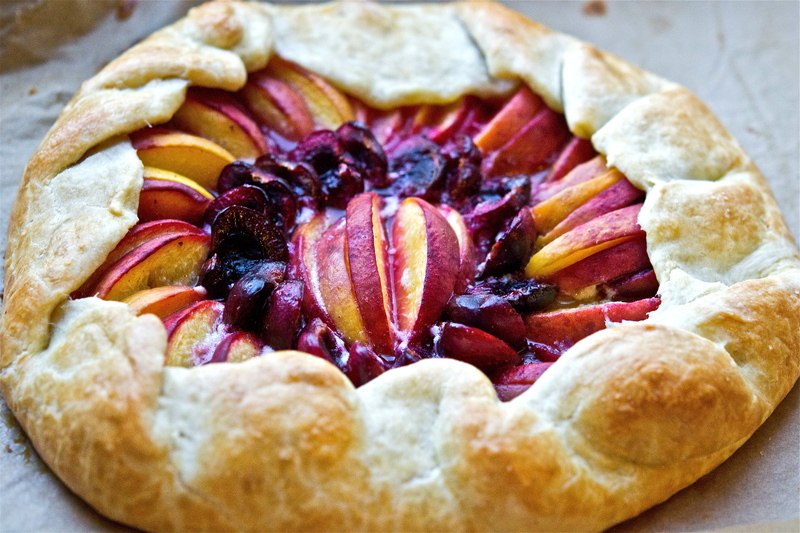 So when I was asked to make a summery dessert for a cookout with my boyfriend’s family, this Ginger Peach and Cherry Galette was my response…and it was truly stunning. This galette calls for a sweet pâte brisée (or a pastry dough), which incorporates a touch more sugar and eggs than your standard crust. The eggs (inevitably) make for a very sticky dough, so you will want to take that into account when rolling and transferring the pastry to a pan. The texture is also softer than your typical pastry dough, and comes together in much less time. Even so, it is still important to keep your ingredients as cold as possible during the preparation (a cardinal rule for ALL doughs). The original recipe only called for peaches…I just happened to have poor luck at the market, so 2 of my 4 peaches were rotten. 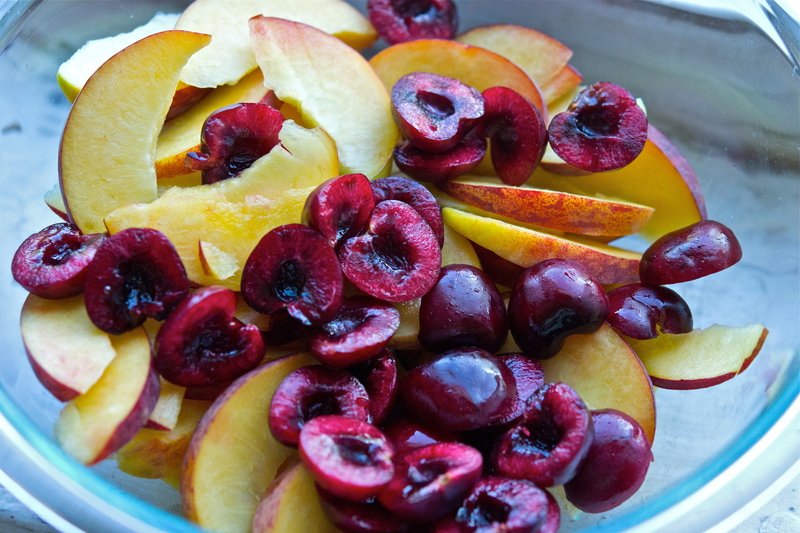 Thankfully I had a bag of fresh cherries in the fridge that I had been become quite addicted to, so this was the perfect solution for both the galette and my self control. The result was a colorful, fresh, and stunning dessert – you can use any fruit you like (except for watermelon or cantaloupe…that would be odd), and even change up the spices. Click HERE for the recipe to this beautiful summer treat! The piece I chose for this pairing is Françaix’s Concertino pour piano et orchestre – composed in 1932, the work is less than 10 minutes in length, and is true to the composer’s neoclassical and witty style. The recording included below is by the composer himself (he often performed his own works for piano). 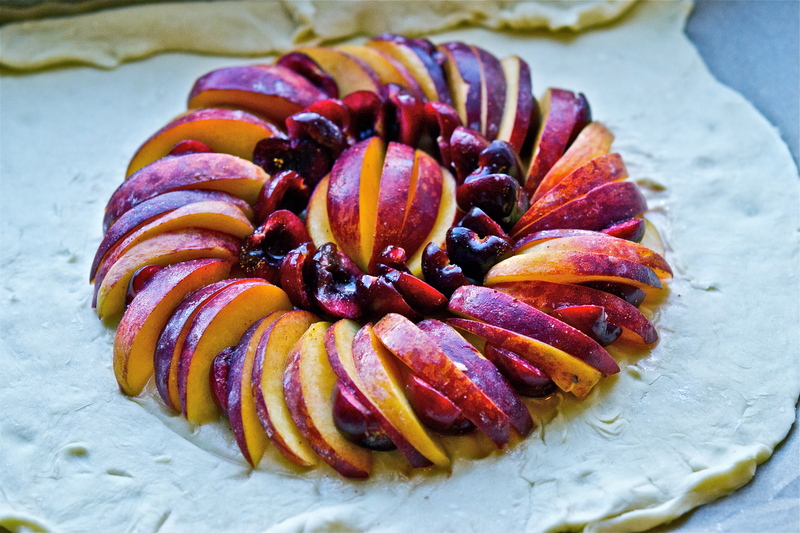 Like this galette, the colors and texture are quite visceral. It’s a lovely little piece, and I hope you enjoy it!